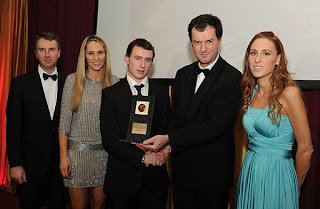 Congratulations to Eamon Wallace on winning the Meath young Sports Star of the year award on Friday night, which was presented to him at the Knightsbrook Hotel, Trim. Eamon’s sporting achievements in 2012 included winning gold in the U19 100 and 200m at the All Ireland track and field championships in July, he also had great success on the GAA field winning the Vocational Schools All Ireland B football Championship, and the Meath minor and junior football championship with Ratoath, GFC. Registration Evening Mon 7th Jan 2012 7:45-9pm.